I am an AI resident at Google Brain Mountain View. I am interested in deep learning research with inspiration from neuroscience. 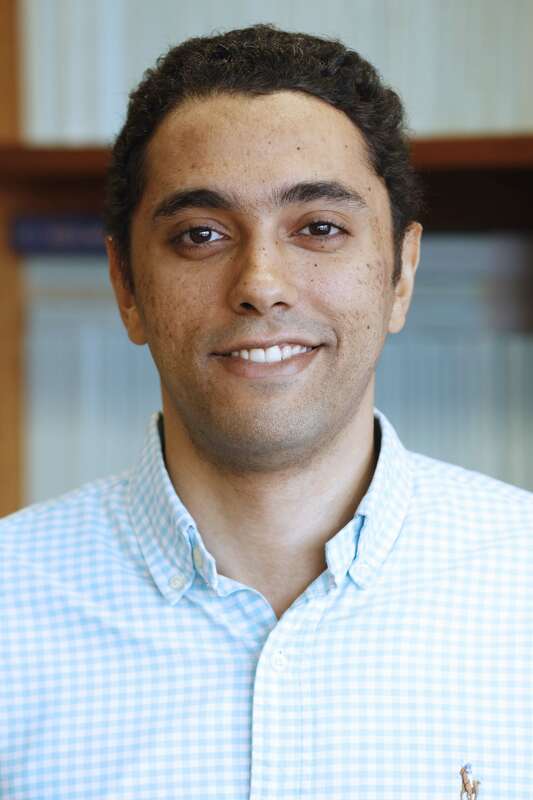 In particular, I am interested in studying properties and problems of artificial neural networks, and investigate their overlap with neural systems. This investigations is critical and can help develop useful insights for direction for improvement in deep learning research. I completed my B.S. from the American University in Cairo (AUC) with a major in Electronics Engineering and a minor in Computer Science. After my B.S., I joined the founding class of King Abdullah University of Science and Technology (KAUST), where I pursued my M.S. in Electrical Engineering under the supervision of Jürgen Kosel and studied EKG signals to extract respiratory-related information. In 2011, I moved to the US to pursue my PhD in Electrical Engineering at Washington University in Saint Louis, where I started to develop my research interest for machine learning and computational neuroscience. In 2013, I moved to Columbia University PhD program, where I joined the Center for Theoretical Neuroscience. In 2017, I completed my PhD in Neuroscience from Columbia University in the lab of John P. Cunningham, where I worked on problems in computational neuroscience and machine learning. During my PhD I contributed to the field of computational neuroscience through designing methods for identifying and validating structures from complex neural data. I am interests in research topics in deep learning and computational neuroscience. The notion of margin, minimum distance to a decision boundary, has served as the foundation of several successful results for both classification and regression tasks. However, most large margin algorithms are applicable only to shallow models; and conventional margin methods for neural networks only enforce margin at the output layer. Such methods are therefore not well suited for deep networks. In this work, we propose a novel loss function to impose a margin on any chosen set of layers of a deep network (including input and hidden layers). Our formulation allows choosing any norm on the metric measuring the margin. We demonstrate that the decision boundary obtained by our loss has nice properties compared to standard classification loss functions. 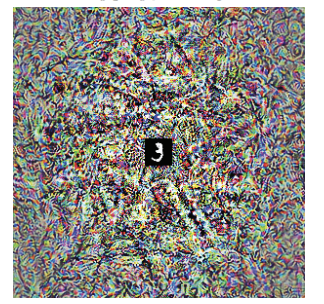 Specifically, we show improved empirical results on the MNIST, CIFAR-10 and ImageNet datasets on multiple tasks. Deep neural networks are susceptible to adversarial attacks. Previous adversarial examples have been designed to degrade performance of models or cause machine learning models to produce specific outputs chosen ahead of time by the attacker. We introduce adversarial attacks that instead reprogram the target model to perform a task chosen by the attacker---without the attacker needing to specify or compute the desired output for each test-time input. This attack is accomplished by optimizing for a single adversarial perturbation that can be added to all test-time inputs to a machine learning model in order to cause the model to perform a task chosen by the adversary when processing these inputs---even if the model was not trained to do this task. These perturbations can be thus considered a program for the new task. We demonstrate adversarial reprogramming on six ImageNet classification models, repurposing these models to perform a counting task, as well as two classification tasks. Single neuron responses are highly complex yet are able to flexibly perform different computations underlying different behaviors through their collective activity. 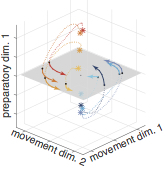 Here I study structure of preparatory and movement computations in motor cortex. I demonstrate that collective activity patterns of motor cortical neurons are orthogonal during successive task epochs yet are linearly linked, indicating a degree of flexibility that was not displayed or predicted by existing cortical models. These results reveal a population-level strategy for performing separate but linked computations. Structure an expected byproduct of simpler phenomena? Collective patterns of neural responses are increasingly studied from various neural systems. These population structures give concise pictures of the activity of populations beyond the complexity of single-neurons, and are relied upon to support various hypotheses about neural mechanisms. However, the increasing use of population structures without proper validation pose serious problems that could undermine the conclusions drawn from population data. In particular, we should be genuinely concerned that population findings may be outcomes of a powerful data analysis method rather than a fundamental structure as any identified population structure may be a trivial consequence of primary features we already know exist in data. In this work, I use ideas from Fisher randomization, optimization and maximum entropy to design novel methods that to generate random surrogate data while preserving the data primary features, thus overcoming the shortcomings of previous validation methods. With this method, one can perform statistical tests, and be confident that epiphenomenal structures can be identified or ruled out, providing a general-purpose platform for validating population structures for the whole scientific community. ● Antonio H. Lara, Gamaleldin F. Elsayed, Andrew J. Zimnik, John P. Cunningham, Mark M. Churchland "Conservation of preparatory neural events in monkey motor cortex regardless of how movement is initiated" Elife 2018. ● Gamaleldin F. Elsayed, Dilip Krishnan, Hossein Mobahi, Kevin Regan, Samy Bengio "Large Margin Deep Networks for Classification" NIPS 2018. ● Farzaneh Najafi, Anne K. Churchland, Gamaleldin F. Elsayed, Eftychios A. Pnevmatikakis, John P. Cunningham "Excitatory and inhibitory neural populations coordinate to drive decisions in both novice and expert subjects" COSYNE 2018. ● Andrew Miri, Claire L. Warriner, Jeffrey S. Seely, Gamaleldin F. Elsayed, Larry F. Abbott, John P. Cunningham, Mark M. Churchland, Thomas M. Jessell "Motor cortex engages output circuits in a behaviorally-selective manner" COSYNE 2017. ● Farzaneh Najafi, Gamaleldin F. Elsayed, Eftychios A. Pnevmatikakis, John P. Cunningham, Anne K. Churchland "Single-trial decision can be predicted from population activity of excitatory and inhibitor neurons" COSYNE 2017. ● Daniel Kimmel, Gamaleldin F. Elsayed, John Cunningham, William Newsome "Encoding of value and choice as separable, dynamic neural dimensions in orbitofrontal cortex" SNE annual meeting 2016. ● Antonio H. Lara, Gamaleldin F. Elsayed, John P. Cunningham, Mark M. Churchland "Preparatory responses in primary motor and premotor cortex are conserved across self-initiated, quasi-automatic and cue-initiated movements" SfN annual meeting 2016. ● Farzaneh Najafi, Gamaleldin F. Elsayed, Eftychios A .Pnevmatikakis, John P. Cunningham, Anne K. Churchland "Population dynamics of excitatory and inhibitory neurons in mouse parietal cortex during decision-making" SfN annual meeting 2016. ● Gamaleldin F. Elsayed, Matthew Kaufman, Stephen Ryu, Krishna Shenoy, Mark M. Churchland, John P. Cunningham "Neural Population Dynamics in the Motor Cortex: Interesting or Epiphenomenal?"" Modelling Neural Activity (MONA2), 2016. ● Daniel Kimmel, Gamaleldin F. Elsayed, John P. Cunningham, Antonio Rangel, William Newsome "Encoding of value and choice as separable, dynamic neural dimensions in orbitofrontal cortex" COSYNE 2016. 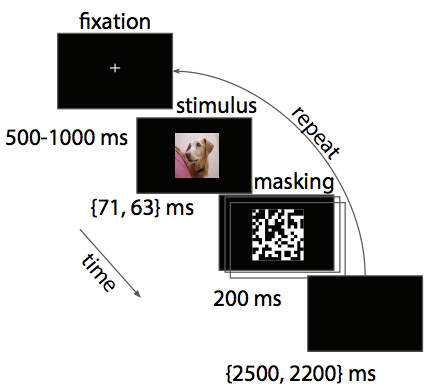 ● Antonio H. Lara, Gamaleldin F. Elsayed, John P. Cunningham, Mark M. Churchland "Conservation of neural events across self-initiated, quasi-automatic and cue-initiate movements" COSYNE 2016. ● Gamaleldin F. Elsayed, Matthew Kaufman, Stephen Ryu, Krishna Shenoy, Mark M. Churchland, John P. Cunningham "Testing the Statistical Significance of Dynamical Structure in Neural Population Responses" SfN annual meeting 2015. ● Gamaleldin F. Elsayed, Antonio H. Lara, Mark M. Churchland, John P. Cunningham "Separating population structure of movement preparation and execution in the motor cortex" COSYNE, 2015. ● Gamaleldin F. Elsayed, Matthew Kaufman, Stephen Ryu, Krishna Shenoy, Mark M. Churchland, John P. Cunningham "Characterization of dynamical activity in motor cortex" COSYNE, 2013. ● Gamal El Din Fathy Amin, Jürgen Kosel, Eugenijus Kaniusas, Stefan Traxler "Estimation of lung volume and pressure from electrocardiogram" Proc. of IEEE International Symposium on Medical Measurements and Applications, 2011.